When Southampton sacked Nigel Adkins in favour of new manager Mauricio Pochettino last January, Saints legend Matt Le Tissier called the club a "laughing stock". Adkins, now at Reading, had led Southampton to consecutive promotions, taking them from 22nd in League One in September 2010 to 15th in the Premier League in the space of 28 months. The condemnation of his sacking from Le Tissier, who was known as 'Le God' during a 16-year playing career at Southampton, was far from isolated. Fast forward 10 months, though, and Southampton are sitting third in the Premier League after their best start to a top-flight season. It seems that chairman Nicola Cortese's decision has proven astute although not necessarily justified in everyone's eyes. Le Tissier, who scored 209 goals in 462 appearances for Southampton, said: "Even if we go on and win the Premier League this season, I still think he was treated disgustingly and I don't think the club came out of it particularly well. "But we are now sat third in the league and you won't find a happier Southampton fan than me. At that point in time that was my opinion and I will stick by it, at this point in time Pochettino has done very, very well." We will never know if Adkins could have performed the same miracles at St Mary's Stadium, but there is no doubting that Pochettino, 41, has given Saints a new system against which Premier League teams are struggling to compete this season. Southampton have the best defence in the division, having conceded only five goals in 11 games, which have included trips to Liverpool and Manchester United. They are arguably the fittest, too, as Prozone statistics show they have covered more distance than any other team this season. And although they face Arsenal at the Emirates Stadium this Saturday before travelling to Chelsea the weekend after, there are suggestions that Southampton's style is better suited to taking on the big teams, putting a different slant on whether they can maintain their incredible start to the season. Pochettino's insistence on a high-pressing game was evident as soon as he was installed in the job last term. His second game was a 2-1 defeat at Old Trafford but, at times, Sir Alex Ferguson's side struggled to get out of their own half as Rickie Lambert and Jay Rodriguez put them under pressure from the front. That system has become more refined this season as players become used to pressing in packs. Not only do Southampton cover more ground than any other team but they are also the Premier League's leaders for high intensity running, classed as more than 5.5 metres per second. Since Pochettino came in, this has increased by nearly 5%. And should the opposition get through the first line of defence, they will come up against midfielder Victor Wanyama and centre-back Dejan Lovren, who have added extra protection to the side since signing in the summer. Le Tissier says Lovren has been Southampton's player of the season so far. Meanwhile, former Saints striker Alan Shearer believes the team's success has come from being a well-drilled defensive unit, but feels it is just as important to have technical players like Adam Lallana and Luke Shaw in the team. "You need to be very agile and very fit to press to the degree that Southampton are," he told BBC Sport. "You also have to be very comfortable on the ball when you get it back because that can work as a rest period for you when you are passing it around." Shearer, who came through Southampton's youth team before scoring 43 goals in a four-year spell on the south coast, underlines how pressing in the opposition half can put Saints on the attack more quickly. But while Pochettino's side have a reasonable return of 15 goals in 11 Premier League games, there is a link between them winning the ball back in the opposition half and the low number of goals they have conceded. Only Tottenham have regained the ball more this way (158 times to Southampton's 145), and Spurs have the second best defence in the league, having conceded six goals. Southampton have also conceded the fewest shots on target this season, with Tottenham third behind Manchester City. In the 1-0 victory over Liverpool and the 1-1 draw with Manchester United, Saints made more tackles in the opposing half than their opponents. Against United they made more fouls in this part of pitch, potentially stopping a quick attack at source. Le Tissier told BBC Sport: "A high-pressing system has worked very well so far, especially against teams that like to pass the ball around the back, it gives Southampton a chance to try and win the ball back in their final third. "The games we've struggled in this season are probably against teams who don't pass out much from the defence, so we lost at Norwich and we drew at home with West Ham and Sunderland." Southampton's increased fitness has come from Pochettino's insistence on double training sessions, although they are not always a hit with the squad. One senior player is said to have returned from a recent international break hoping for a rest and was met with an ultimatum of whether he wanted to play in the next game. While results are good, grumblings about this will no doubt be minimal, but the question now is whether they can sustain that level of intensity through the season. With only the league and FA Cup to contend with, Shearer does not think Southampton's fitness levels will drop off. But Le Tissier is concerned that using the same team might take its toll. "To be fair, they have good energy levels and they are young too," he added. "I think we are one of the teams to have used the fewest amount of players this season so hopefully we can keep everybody fit. When our best XI is out on the pitch, we give anybody a game as we have already proven." 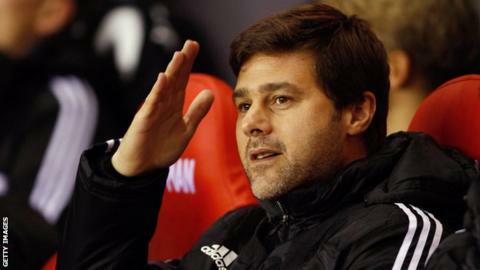 The limited depth of Southampton's squad may yet play its part but after they beat Hull 4-1 before the international break, Pochettino said there were no limits to his team's ambitions this season. Both Shearer and Le Tissier are more cautious, believing a top-eight finish would be a fantastic achievement. "It's a great story," added Shearer. "I don't think anyone would have predicted they would be up there now but they deserve to be. From the neutral's point of view, the longer they stay up there, the better it is for the Premier League." Criticism over Adkins's dismissal may have been justified, but it is the manager and players who are laughing now.